The Site Navigator displays the pages of a site in a hierarchical manner. The icon shown is either a general page icon, or a page's thumbnail image. The Site Navigator is located at the left of all document windows. To work with a page, you select it in the Site Navigator and it appears in the Web View. 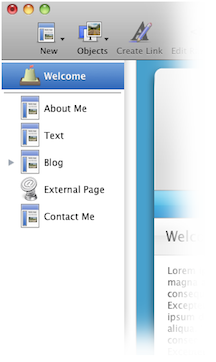 You can also select multiple pages in the Site Navigator. Hold down the Command key and click to select or deselect a page. Hold down the Shift key and click a page. All pages between the previous selection and the page you click are highlighted. This is useful if you want to drag multiple pages at once, or to use the "Group as Collection" command. A site's Home Page always appears at the top of the Site Navigator and is a collection that contains all other pages of the site. Other collections are indicated by the disclosure triangle next to them. Click the triangle to hide or show the pages within the collection. Several kinds of pages can be created by dragging items into the Site Navigator. For example, you can drag an image from the Media Browser into the Site Navigator to create a Photo page. You can also use the Site Navigator to arrange or rearrange the structure of a site. For more information, please see "Arranging the pages of a site." If you are working on a large site, you can set the Site Navigator to use small page icons. If you are seeing hash marks (diagonal lines) across some of the pages in your site navigator, you are using Sandvox in trial mode. These indicate the pages that cannot be published. Purchase a license to Sandvox to publish all pages.